by Sewell Elias Slick. Hardbound, 188 pages, 6" x 9". 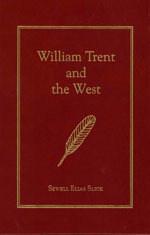 The biography of William Trent, one of the major figures in early colonial history. He was in an official capacity at the important councils at Logstown in 1752 and Eston in 1757; he was with Gen. John Forbes, Col. Bouquet, and Maj. Washington as they blazed their way through the Western Pennsylvania wilderness. He was in on the founding of Pittsburgh. He partnered with George Croghan and his journals of his trips with Andrew Montour into the Ohio country are some of the most important documents we have on the early history of the westward movement. A lusty figure in the days of early westward movement in the mid 18th century when anything beyond the Susquehanna River was considered the frontier.